Like William Maclure and the five children of Robert Owen who resided in New Harmony, Frances Wright, known in her day as Fanny Wright, was born in Scotland. She and her sister Camilla were quite young when both parents died, and the sisters inherited a fortune. 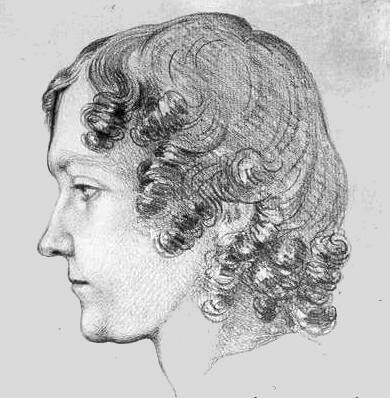 Shown here is a pencil portrait of Frances Wright, dated 1835. Permission and credit: The Pierpont Morgan Library, New York. MA 1950. By 1824, Wright had written a play, Altorf, produced in New York City, and books entitled A Few Days in Athens and the widely acclaimed Views of Society and Manners in America. In the evening the Misses Wright, who were on their way to New Orleans, to meet the Marquis De LaFayette, arrived. They brought us news of my Father's proceedings in Washington. Miss Wright is a very learned and a fine woman, and though her manners are free and unusual in a female, yet they are pleasing and graceful and she improves upon acquaintance." That same year, Wright urged Congress toward A Plan for the Gradual Abolition of Slavery in the United States Without Danger of Loss to the Citizens of the South, and she purchased 640 acres near Memphis, naming the tract Nashoba. She purchased slaves and freed them to settle in the experimental colony at Nashoba. By 1828, the experiments at both Nashoba and New Harmony had failed. Robert Owen had left New Harmony, but his eldest son, Robert Dale Owen, had stayed, and Wright joined him and assisted as editor of the New Harmony Gazette. The following year, she and Owen moved to New York City and emerged as leaders of the free-thought movement through their newspaper, the Free Enquirer. Among Wright's themes were the liberalizing of divorce laws, birth control, free state-run secular education, the political organization of laborers, equal rights for women, and objectionable ecclesiastical influences in politics. Some of these aims closely paralleled those of Robert Owen, who had returned to England, where his ideas were increasingly taking hold. Wright's aims also paralleled those of William Maclure. In Paris, on July 22, 1831, Fanny Wright married William Phiquepal d'Arusmont, whom she had met in New Harmony. He was one of the Pestalozzian teachers who had come to Indiana on Maclure's "Boatload of Knowledge" in 1826. The d'Arusmonts lived in Paris until 1835, when they moved to Cincinnati. They divorced in 1852, two years before her death in Cincinnati. Celia Morris, Fanny Wright: Rebel in America, University of Illinois Press, Urbana, 1992. First published by Harvard University Press, 1984.